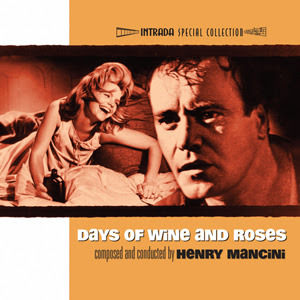 Days of Wine and Roses opens with Henry Mancini's famous Academy Award-winning song melody playing on solo French horn, and from there Mancini creates a moving, emotionally rich orchestral score to accompany the descent of two alcoholics tragically intertwined in a downward spiral of despair and heartbreak. Mancini’s subtle, understated score is a model of musical economy, with the song melody anchoring the score, whether in simple arrangements like guitar solo, a string elegy, or dissected and distorted, punctuated by Mancini’s signature stinger chords when alcoholism nearly drowns its victims. Dark low strings and harmonic clusters never shy away from depicting the emptiness at the bottom of a bottle, but Mancini wisely steers clear of scoring the horrifying detox scenes, instead concentrating on the poignant dissolution of the relationship. The trademark “easy listening” Mancini sound can be found in the film’s many jazz source cues. From tinkling piano riffs and gentle brush strokes playing on Kirsten’s “hi-fi” and the lounge piano of “Cocktail Hour” to the elongated stride piano figures in “No Guts” and his signature use of vibraphone, Mancini’s refined orchestrations never overwhelm the drama, yet lend the film a contemporary period feel. While Mancini made a common practice of re-recording albums of his film scores, he prepared no such album for Days of Wine and Roses. “A problem arose from the rerecording of those scores,” he wrote in his autobiography. “The albums were made up of the most melodic material from the films. A lot of the dramatic music—which is what I really loved to do and really thought I had a feeling for—was left out." Given the dominance of dramatic music in this film, the record label was not interested in releasing this particular Mancini soundtrack. Decades later, Intrada finally presents the premiere release of the soundtrack. Warner Bros. provided access to the complete mono session elements, vaulted in excellent condition on 1/4″ full-track tape. Days of Wine and Roses stars Jack Lemmon and Lee Remick as a young couple drowning in the liquored depths of alcoholism.